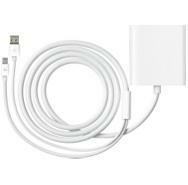 We waited and waited for Apple’s Mini DisplayPort to Dual-Link DVI adapter to start shipping. Then we waited some more. All that waiting gave us time to think, and among the foremost thoughts in our head was: “Hey, wait, did we actually order a Dual-Link DVI DisplayPort adapter?” Turns out not so much, but that may be just as well, since many of those who have received the $99 (yowch!) cable don't seem very happy with it. Gizmodo reported that the adapter they got ran into a frequent problem where the connected display would flicker and then apparently lose about half of the data being sent over—more like a single-link DVI adapter, amirite?—resulting in an unpretty, corrupted picture. They suggest that it might be related to power issues or interference, as plugging in USB devices seems to hasten the problem along. Lest you think this is some sort of blogger-only problem, Gizmodo also points to a couple of Apple discussion threads on the issue, and the reviews in the online Apple Store are, as of this writing, largely negative—though, if I paid $100 for a cable that doesn’t do the one thing it does, I’d be writing irate reviews too. Then again, maybe there are just a bunch of bum cables out there. Anybody out there in MacUserland have one of these doohickies? How are you faring?